Goeido a été très efficace pour se débarrasser de Takakeisho. 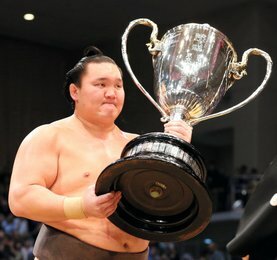 Le yokozuna Kakuryu a eu une belle frayeur jeudi, mais grâce à une seconde chance, il a pu maintenir sa place de leader du tournoi. 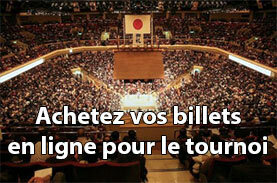 Poussé au bord des ballots de paille par Takarafuji, le yokozuna n’a pas pu garder ses deux pieds à l’intérieur lorsqu’il a poussé vers le sol son adversaire. 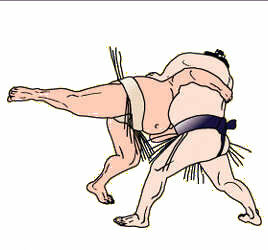 Incapable de déterminer si le pied de Kakuryu avait quitté le dohyô avant que l’épaule de Takarafuji ne touche terre, les juges ont ordonné de refaire le combat (torinaoshi). La deuxième fois, le Mongol ne s’est pas trompé et a utilisé toute sa force pour rapidement sortir Takarafuji. Cette victoire permet à Kakuryu de rester invaincu tout comme trois lutteurs, les maegashira Shohozan et Kaisei. 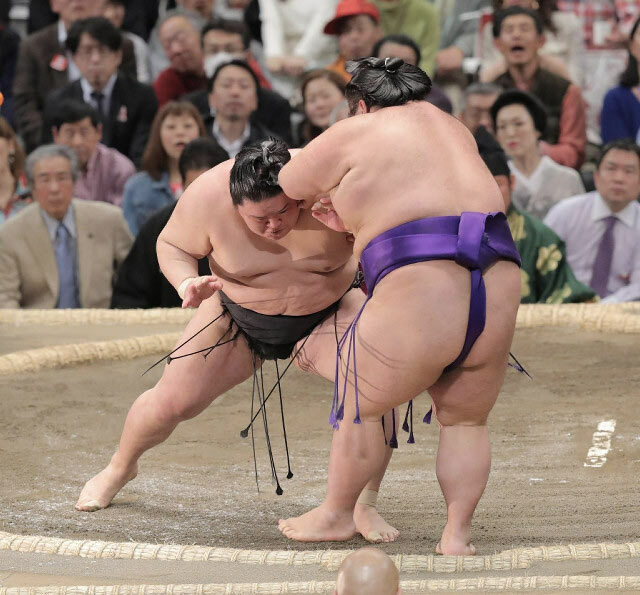 Conduit au bord de l’anneau dans son combat contre Chiyomaru, Kaisei a utilisé ses 205 kilos pour repousser son adversaire avant de le sortir en l’agrippant par le mawashi. 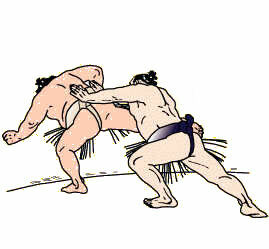 Face à Arawashi, Shohozan a gardé son équilibre après une tentative de lancer par son adversaire. Le Japonais a terminé le travail par yorikiri. 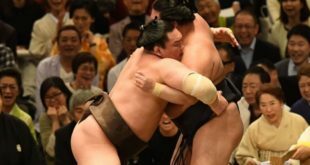 Après un départ décevant, l’ôzeki Takayasu a obtenu sa troisième victoire consécutive en battant Kotoshogiku (1-4). 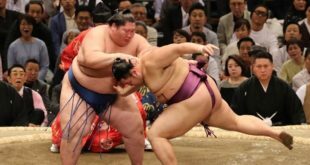 Malgré les fortes poussées de son adversaire, Takayasu a démontré une force et une technique impressionnantes pour prendre le contrôle de la situation avant de le jeter au sol. L’ôzeki Goeido (3-2) a écrasé Takakeisho (2-3) en le repoussant rapidement. Le komusubi Ichinojo a battu Endo (3-2) et passe à 4-1. Dès le début du match, les deux hommes sont restés immobiles pendant plusieurs secondes avant que le géant mongol n’utilise son avantage de poids de 61 kg pour remporter la victoire. Le sekiwake Tochinoshin (3-2) a remporté sa troisième victoire contre le komusubi Chiyotairyu (1-4) après avoir subi sa deuxième défaite la veille. Le vainqueur du tournoi de janvier concours avec une blessure au pied. Le sekiwake Mitakeumi (4-1) s’est emparé d’une quatrième victoire en battant Tamawashi (2-3). Après un vif échange de coups et de gifles, Mitakeumi a pris le dessus en expulsant le Mongol par oshidashi. 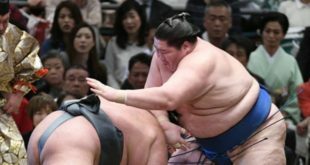 Yokozuna Kakuryu survived a scare Thursday to remain undefeated on the fifth day of the 15-day Spring Grand Sumo Tournament. Pushed to the edge of the straw bales by No. 2 Takarafuji, the sole grand champion at Edion Arena Osaka failed to keep both feet inside while pulling down his charging opponent. 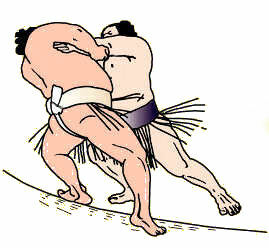 Unable to determine whether Kakuryu’s foot left the ring before Takarafuji’s shoulder hit the ground, the judges ordered a rematch. The Mongolian made no mistake the second time around, using his strength to quickly drive the winless Takarafuji out. 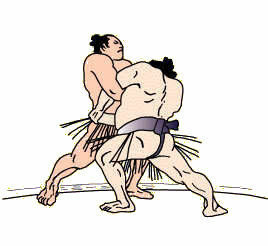 The victory in the final bout of the evening left Kakuryu as one of three wrestlers with a perfect record after the fifth day of the tournament, along with No. 4 Shohozan and No. 6 Kaisei. Forced to the edge of the ring in his bout with No. 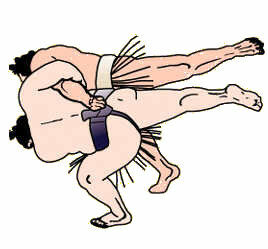 5 Chiyomaru, Brazilian-born Kaisei used his 205-kilogram frame to hold off his opponent before lifting him out by the belt. 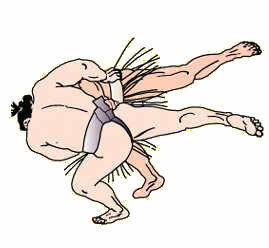 Facing Arawashi, Shohozan kept his feet following an attempted throw before using his taller opponent’s momentum to force the No. 2 maegashira out. 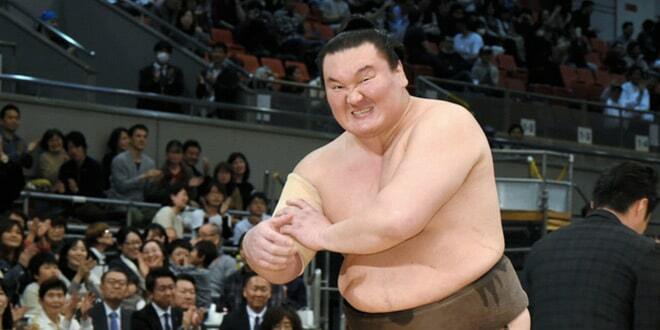 Following a disappointing 0-2 start, ozeki Takayasu secured his third straight victory by throwing down No. 3 Kotoshogiku (1-4). 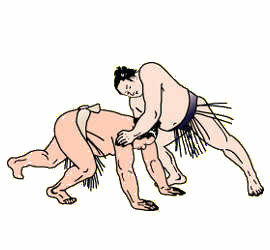 After being pushed onto the back foot, Takayasu demonstrated impressive strength and technique to hold off the former sekiwake before tossing him to the ground. Ozeki Goeido (3-2) overwhelmed No. 3 Takakeisho (2-3), quickly pushing him out backwards for the Osaka native’s third win at his home venue. Komusubi Ichinojo beat No. 1 Endo (3-2) to move to 4-1. After the opening tussle, the pair stayed locked motionless for several seconds before the giant Mongolian used his 61-kg weight advantage to bulldoze the lower-ranked wrestler out of the ring. 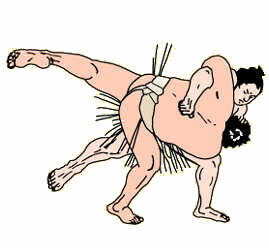 Sekiwake Tochinoshin (3-2) picked up a much-needed win against komusubi Chiyotairyu (1-4) after suffering his second loss the previous day. The New Year tourney winner, who came into the Osaka meet carrying a foot injury, agilely maneuvered behind his charging opponent and quickly forced him out. 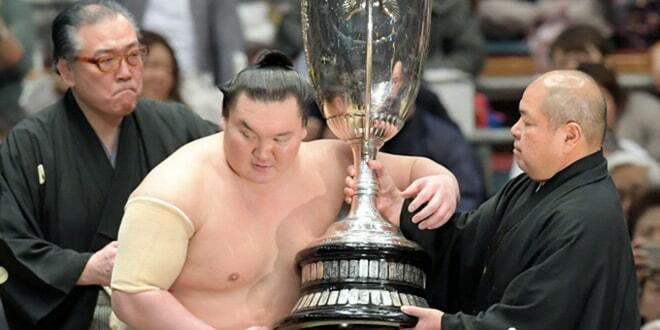 Sekiwake Mitakeumi (4-1) stayed in the hunt by beating Mongolian top-ranked maegashira Tamawashi (2-3). 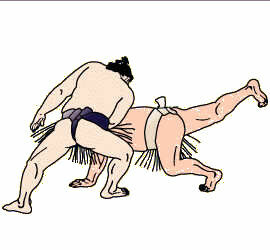 The pair traded pushes and slaps after Mitakeumi attempting a throw in the opening exchange, with the Japanese-born wrestler getting the victory by push out.